I love this product! As i'm nearly at the end of the tube, I've realised how awesome this product is. Not only is it a BB Cream, it also has really high sun protection as well. 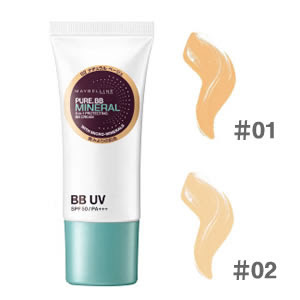 The Maybelline Pure Mineral BB Cream is only available in the Asian market as it is Japanese line (as i am aware) as they have a separate Maybelline line - which i love! The feel of this cream is quite light, despite the colour. It gives a great shiny look with it's sun protection. It comes in two shades - and here i have the #01 shade. Despite it not being as thick and heavy, coverage is still great. The 30ml tube is great, lasts for a long time and is super easy to twist the lid off and use. The size isn't huge too, which is great to put in travel size pouches as well. This is my go to foundation/bb cream for sun protection! The added sun protection just makes my skin glow! Love it! !